Creating a plan for managing and distributing wealth during disability or after death is a complicated process. Your clients are faced with myriad documents, concerns, and decisions that require careful consideration. One way that you, the financial advisor, can help your clients is by steering them clear of the 10 major estate planning pitfalls. Avoiding these missteps can help eliminate unnecessary taxes and, more important, help ensure that clients' estate planning documents match their wishes and goals. Among other things, trusts are designed to preserve privacy, minimize estate administration expenses, and transfer assets to beneficiaries according to the grantor's wishes. Oftentimes, clients spend time and money executing a trust to suit their planning goals but fail to complete the process by funding the trust. If a client's trust has a provision related to a particular asset, the trust should own that asset. Assets not owned by the trust will not be subject to its provisions. A common addition to a revocable trust is a pour-over will, a document that transfers any probate assets to the trust. This is just a safety net, though; assets with beneficiary designations will still pass to the named beneficiary. Problems often arise when clients neglect to update their estate plans to reflect significant events in their lives. A financial planner's role in estate planning is uniquely suited to helping clients ensure that their documents match their financial wishes. Consider a young couple who execute a simple estate plan consisting of "I Love You" wills, leaving everything outright to each other or, if they should both die, to a trust for their new baby and any children born later. Fast-forward 20 years: Their children are in college and the protective distributions in their testamentary trust are no longer relevant. They've also accumulated significant assets over the years and don't have provisions in place to help minimize taxes. Clearly, the plan they drafted years ago no longer meets their needs. Outdated beneficiary designations can derail an estate plan. Few clients would purposefully leave a large life insurance sum to an ex-spouse or, by not electing a beneficiary, subject an asset to the creditors and expenses of a probate estate. Regularly review beneficiaries with your clients to help uncover any potential issues and start a discussion about alternative designations. Does the trustee have the financial and administrative knowledge to administer the trust? Is he or she trustworthy to make smart financial decisions? Is the appointee capable of making difficult health care decisions if necessary? If your client is considering naming his or her trust as the beneficiary of the retirement accounts, the trust should be reviewed to ensure that it meets the IRS "see-through" trust rules. These rules dictate the trustee options to draw assets from the retirement account. Without such language, the trustee's options will be significantly limited and may result in negative income tax consequences. In today's environment, clients will need a power of attorney that contains provisions specific to retirement plan assets, including the power to make contributions, roll over benefits, establish new accounts, endorse checks and receive distributions, elect forms of payment, and borrow money. Financial institutions and medical personnel may be reluctant to accept advance directives executed many years in the past. Often, this is because they're not familiar with the form of an older document. Also, older documents may not contain certain legal provisions, such as HIPAA privacy measures, that grant a client's agent authority to carry out his or her responsibilities. If out-of-state property is owned individually rather than by a trust, it will be subject to ancillary probate. This means that the heirs will need to open a probate estate in that state and a probate estate in the state of residence to coordinate the transfer of the property. Clients can steer clear of this complication by transferring any out-of-state real estate to a trust and working with their attorney to ensure that all appropriate filings are made. Some clients leave their personal effects to be divided equally among their beneficiaries, intending for their executor or trustee to oversee the process. In reality, most personal items tend to disappear on a first-come, first-served basis before any formal estate or trust settlement begins. Clients may not want to believe it, but survivors rarely agree on who should get what upon a relative's death—especially when it comes to items with sentimental or monetary value. If disputes arise, a probate judge may need to intervene. Clients should make a list detailing who will receive which items—and then add this to final estate planning documents. Often, provisions can be drafted to allow frequent updates to the list without revising the client's formal documents. And no, putting sticky notes on the items themselves is not enough! During an estate plan review, it's not uncommon for a client to hand you a stack of documents and say, "I have no idea what's here or what they do." If the documents were drafted many years ago, clients simply may not remember the decisions they made at that time, or they may not realize the implications of their decisions. Estate planning can be complex, but it's essential for clients to understand each document's role and how it benefits them and their beneficiaries. Otherwise, how can you or your clients be sure that their estate plan will help them achieve their goals? 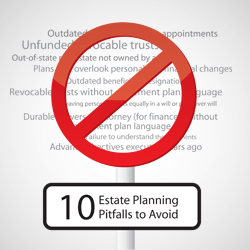 Have you identified any other estate planning pitfalls? How often do you review clients' plans to address these concerns? Share your best practices by commenting below.